Headquartered in Conover, North Carolina, CoPak has quickly grown to become an industry leader in snack food products. Founded in 2002, the Company has differentiated itself and expanded its customer base with advanced manufacturing capabilities and certifications. For more information, please visit www.copaksolutions.com. 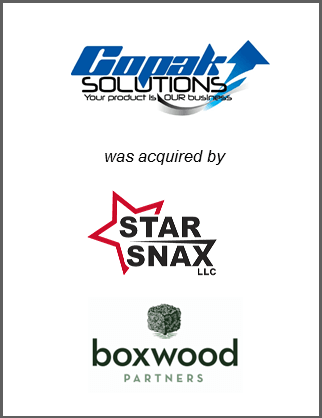 Boxwood Partners acted as the exclusive advisor to CoPak Solutions Inc. in sale to Star Snax.